Okay, it's time to stop bombarding you with baby donkey photos (at least for today), and start getting late summer recipe serious. Otherwise tomato and basil season will be over, and this mouthwatering photo will end up sitting in my files for another year. And that would be a shame, because homemade Italian sausage is really good, and homemade Italian sausage pizza smothered with big slices of vine-ripened tomatoes is even better. You'll find my easy pizza dough recipe here, and if you still have garden tomatoes galore (lucky you! ), you can whip up some fresh tomato pizza sauce in minutes. Got a tomato glut? You'll find all my favorite tomato recipes, along with links to my tomato growing posts, at the bottom of this post. I'm hoping to share my simple Pasta with Creamless Pesto Cream Sauce recipe soon, which is extra nice when tossed with a little cooked Italian sausage. If this sounds good, then find yourself some fresh basil, make some pesto pronto, and freeze it in little containers. Here's my favorite pesto recipe, which calls for roasted salted almonds, fresh tomatoes, and a lot less olive oil than most (though the more oil you add, the even better it tastes). 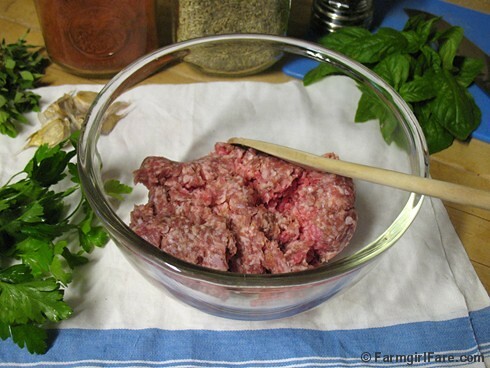 This recipe is simple: you just mix the herbs and spices into the ground meat. You can adjust the seasonings to suit your taste (more garlic, less fennel, double the oregano, etc. ), though in order to taste it you'll need to fry up a little sample. You can use dried basil and oregano (1 teaspoon dried for every 1 Tablespoon fresh) but it won't taste the same. My friend Kalyn, who is a lot more organized in the kitchen than I am, likes to freeze her fresh basil to enjoy all winter long. Basil, parsley, and Greek oregano (which I overwinter in my homemade greenhouse) all thrive in my kitchen garden. Fresh herbs are easy to grow and such a treat to have on hand. You'll find my basil growing links, as well as my other favorite ways to use fresh basil, below. Purists will claim this isn't real sausage since the ground meat mixture isn't stuffed into casings to form sausage links, but I don't care. All I know is that every recipe I've ever made using Italian sausage called for squeezing the meat back out of the casings, which isn't fun. You can cook it up right away, bu this sausage tastes even better if allowed to chill in the refrigerator several hours or overnight before cooking. I haven't tried freezing it—either cooked or uncooked—but I do know that Italian sausage and tomato pizza freezes well. Italian sausage to me means ground pork, but I'm sure you could also make this using ground turkey or ground chicken instead. I would definitely recommend seeking out pastured and/or organically raised chicken. In a medium bowl, use a wooden spoon or your clean hands to mix all the ingredients together until well combined. To taste, heat a few drops of oil in a small skillet and fry up a little bit of sausage. Try not to fry up too many samples. Chill several hours or overnight if you have time. Use on pizza, tossed with pasta, or in any recipe that calls for Italian sausage. When I put it on pizza, I like to brown the sausage in a frying pan first so some of the pieces get nice and crunchy on the edges. So what's your favorite way to eat Italian sausage? © FarmgirlFare.com, the hot and sunny foodie farm blog where the calendar says it's almost fall, but the thermometer says it's a sweltering 90 degrees, which means the sheep and I may not be thrilled, but at least the basil is happy—and my eight varieties of recently planted Asian greens are sprouting up like crazy. I love the idea of making your own Italian sausage. Extra fennel for me please! Yummy! They must be so flavorful. I also add red pepper flakes. I like it with a litte kick! What I especially love is how easy it is to make. You sound like my mom with your extra fennel - she even uses fennel flavored toothpaste! I always have to put in extra fennel when I make this for her. Wow, that looks delicious. My mouth is watering. I am writing down all those recipes. Good stuff. This looks fantastic and so simple! I will definitely try it, especially to put on homemade pizza, which I make almost every week or so. I recently found your blog and I just love looking at your pictures of your baby donkey, dogs, and chickens. (I had a pet chicken when I was little and loved it.) The amazing thing is that you have time to make your delicious-looking recipes and blog too! I can see I've found a fun place to visit. Holy Smokes! I can't even tell you how amazing this looks even (or especially?) at 8 in the morning! I'm adding it to the menu this week! Wow, that pizza looks great. We vowed the other night never to go out for another pizza in our small town. It was horrible. Yummy, yummy. 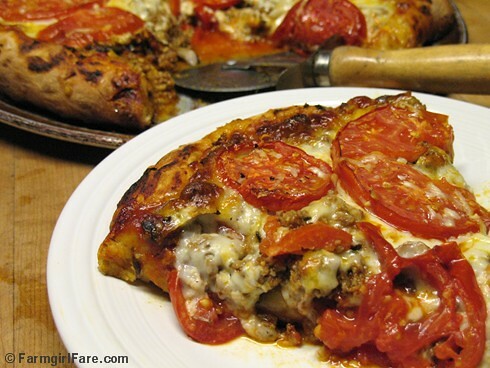 Thanks so much for a new recipe I can add to my hubby's pizza repetoire. Beautiful, Susan! I think one of the 'key' ingredients in your spice mix is fennel, I've learned that it's so important to get that somehow 'Italian' taste. I made this tonight and tossed it in with the tomato sauce I made from all the garden tomatoes. SO DELICIOUS! Too hungry to wait for it to meld in the fridge, and it was still amazing. Thank you!! YES. Thank you for this. I am ready to wade into the deep dark world of sausage making. I guess I don't have that Kitchenaid sausage attachment for nothing. NOM NOM NOM - these look delicious! I love fennel seeds in my sausage too, MMM! Thanks for sharing. Hi Susan..can I replace it with chicken instead? I know this is a very old post but I have to say this is the best Italian sausage! It is so much better than what is found in the stores, and I can control the whole process. I'm making spaghetti sauce on Friday (ok 3 batches) to use up the frozen tomatoes from last season. Thank you for a great recipe! This was so, so good.